CANTON, Mass. (May 6, 2014) – With spring in bloom and Mother’s Day this weekend, Dunkin’ Donuts has arranged a sweeter way to deliver flowers to Mom to celebrate her special holiday. 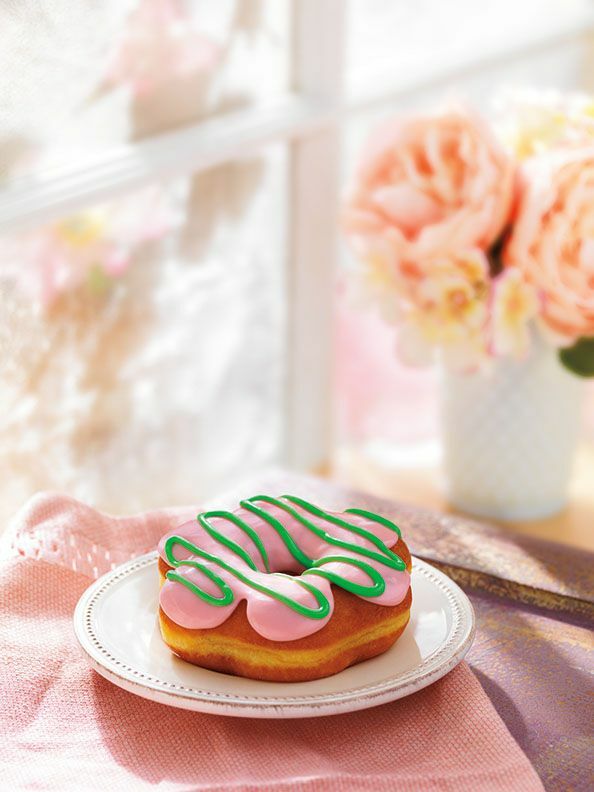 Dunkin’ Donuts, America’s all-day, everyday stop for coffee and baked goods, today announced a new “Flowers for Mom” Donut, a mouth-watering flower-shaped yeast ring donut with strawberry-flavored icing and pastel green icing drizzle. The “Flowers for Mom” Donut is available at participating Dunkin’ Donuts restaurants nationwide through Mother’s Day. In addition, Dunkin’ Donuts is offering a “This Mom Runs on Dunkin’” tumbler to help Mom enjoy her fresh-brewed coffee at home or on the go. The 16-ounce tumbler is top rack dishwasher-safe, and is perfect for fueling Mom throughout her busy day. The tumbler is available at participating Dunkin’ Donuts restaurants nationwide. To help celebrate the many ways mothers make a difference in people’s lives, Dunkin’ Donuts today launched a special Twitter sweepstakes, asking fans to tweet one piece of sweet advice they’ve received from their mom, along with special hashtag #MomsDDay. Today and tomorrow, May 6 and 7, three participants each day will receive two $50 mGifts, one for themselves and one they can gift to a special mom in their life. No purchase necessary, must be 18+ to enter. Void where prohibited. For more information about Dunkin’ Donuts’ #MomsDDay sweepstakes, please visit: dun.kn/mom. Finally, guests looking to keep Mom running with Dunkin’ Donuts food and beverages long after the holiday can purchase limited-edition Mother’s Day virtual Dunkin’ Donuts Cards, available in several fun designs. Dunkin’ Donuts Mobile Cards can be sent via email, text or Facebook through the mGift feature on the Dunkin’ Donuts mobile app, available for both iPhone and Android smartphones. With the mGift feature, users can send a variety of virtual Dunkin' Donuts Cards, which can be redeemed directly from a mobile phone at participating U.S. Dunkin' Donuts locations. All Dunkin' Donuts mGifts can also be added directly to the Dunkin' App, reloaded right from the phone, and used as a fast, convenient way to pay. Along with Mother’s Day themed items, Dunkin’ Donuts recently launched the new Chicken Apple Sausage Breakfast Sandwich. A delicious breakfast sandwich option under 400 calories, Dunkin’ Donuts’ Chicken Apple Sausage Breakfast Sandwich features egg, reduced fat cheddar cheese and a juicy split chicken sausage seasoned with spices and real apple, served on an oven-toasted English muffin. Also, with summer temperatures on the way, Dunkin’ Donuts has partnered with the Arizona Beverages and Arnold Palmer Enterprises to introduce the new Frozen Arnold Palmer® Coolatta, giving guests a cool new way to enjoy the original half iced tea, half lemonade beverage. Dunkin’ Donuts is offering a cool twist on the classic OREO® Cookie as well, with the return of the OREO® Coolatta, available in OREO® Frozen Coffee and OREO® Vanilla Bean varieties. The new Frozen Arnold Palmer® Coolatta and OREO® Coolatta join a Dunkin’ Donuts’ foursome of fruity Coolatta flavors, as Watermelon Coolatta and Blue Raspberry Coolatta return through the summer months, joining year-round favorites Strawberry Coolatta and Minute Maid® Orange Coolatta. Throughout May, Dunkin’ Donuts is making it more affordable to keep cool, as guests can enjoy small Coolatta beverages in any variety for just $1.99 throughout the month.